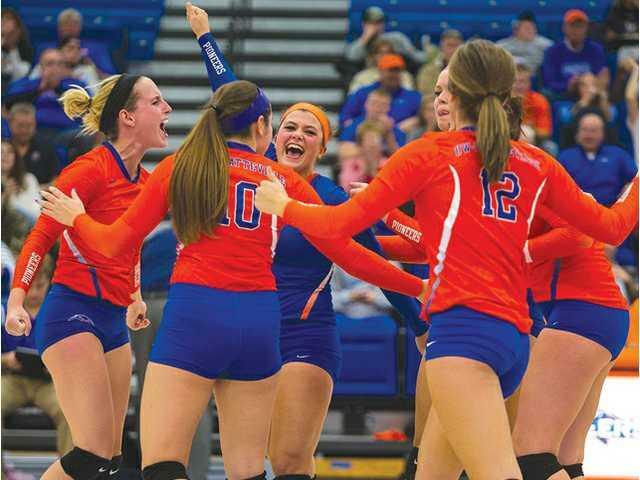 POSTED August 16, 2017 11:49 a.m.
PLATTEVILLE — It’s a new season for UW–Platteville’s volleyball team and with that new season comes a familiar sense of energy. Last year, the Pioneers finished 1–6 in the WIAC, with an overall record of 11–21. Despite finishing last in the conference, with the help of their positive attitudes, the Pioneers upset tri-champion UW–Whitewater in a five-set thriller in the final home match of the season. Birkicht, formerly the Pioneers’ assistant coach, was announced head coach earlier this year. During her time as assistant coach at UW–Platteville, Birkicht helped lead the team to three seasons with records at or above .500, including back to back 21-win seasons in 2011 and 2012. This past year, the Pioneers lost three senior starters to graduation. However, returning for the Pioneers include outside hitter Allison Jensen, middle hitter Ashlee Moore, starting setter Allie Carter, and a large senior class. Five new players will be joining the Pioneers this year including Katie Jones, who previously played for the University of Northern Iowa, and Kielyn Kapugi from Sun Prairie. The Pioneers will report to campus on Friday and play their first match against Westminster College just two weeks later.